Daivajna Somayaji K.N is an expert of Vaastu Shastra .His Programme on Vaastu Shastra in a leading Kannada Channel E-TV draws a very high audience rate consistently. Prominent business and corporate houses are benefited by his Vaastu Shastra advice, and constantly seek his guidance and advice on their commercial and emotional matters. Constructing a house based on Vaastu specifications is not the only criteria for positive energy or positive vibrations to flow. You also need to follow some Vaastu rules on cleanliness to experience the effects of positive energy. The north-east zone is the most auspicious part of the house. The east is the direction of Sun and the north is the direction of Kubera, the lord of wealth. This is the zone, which gives the maximum energy. Today with the increasing population and pollution explosion, people are seeking for flats and apartments in different places. The segmented apartments with multi-storey floors are what they try to seek in order to get peace and prosperity from the hassle of the metro city. 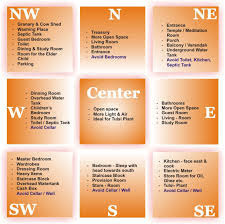 As the problems are increasing flats/apartments are constructed according to Vastu-shastra. However, nothing is considered as perfect so even if the flats are not fully being made with vastu compliance, few things must be taken into account while purchasing any flat. Here are few points, which must be examined in a house to be chosen. A main door with an image of Lord Ganesha increases wealth in an office or factory. The number of doors in an office or a shop should not be in multiples of ten. The number of doors can be the same as your birth date reduced to a single digit, like 10th becomes 1, or any odd or even number according to your birth number. For professionals, a north-facing office is suggested. For businesspersons dealing in fun-food and fashion items, the southeast or south corner shop or office is best. The ideal location for shops dealing in black colored goods like coal, artificial leather goods, etc. would be the south. Hotels, restaurants, electric goods shops would do good business in the southeast corner of the east side. Vaastu recommends regular shapes, which are balanced and symmetrical. Generally, square and rectangular plots, which have all the angles at 90 degrees, are considered appropriate. Square Plots: Plots in which all the sides are equal and at an angle of 90 degrees are considered the most auspicious.Vaastu Purush fits best in a square plot and all his body parts are in good shape leading to all round prosperity and health. Rectangular Plots: Plots in which the opposite sides are equal and all angles are of 90 degrees are considered very auspicious. The ideal proportion of length and breadth is 1:2. Very narrow rectangular plots are not considered auspicious as they make one feel like living in a long corridor. Circular Plots: Circular plots are auspicious for residential and commercial purposes provided the construction is also circular. In case the construction inside a circular plot is square or rectangular, it gives bad results. Triangular Plot: Plots that are triangular are considered inauspicious as they give negative energy. Industrial structures need special attention in Vaastu Analysis. In an Industrial Environment, the human potential is exploited to its maximum in multidisciplinary activities – production clubbed with leadership function, research activity clubbed with market dynamics, achieving impedance – free movement of men and materials in crowded workplace etc. This balancing act needs a perfect understanding of contribution of each of the Vaastu directions to the overall Industrial space. The Indian insight into Vaastu planning is based on the concept of energy helix. This permits analysis of each part of the structure at individual level and then synthesizing these into the total structure. Vaastu Shastra considers a Vaastu as a living being and as such clubs the energetic of the Vaastu with various parameters to make it lively. The character of a living entity is always reflected in its shape, form, size and looks. Similarly, qualities like harmony and rhythm are part of a symmetric structure. In Industrial structures, the contribution of various directions is analysed on the basis of form and shape of the structure as well as the plot. The builders of commercial complexes want to utilize each and every inch, of the space available for construction leaving any space open, without any construction, there may not be profitable to the builder. Commercial Complexes, which are constructed in accordance with the rules of Vaastu-Shastra, become popular and prove to be beneficial and profitable to the business carried on from that campus. Therefore, commercial complexes should be constructed according to the principles of Vaastu Shastra.First of all only two square or rectangular plot should be selected. Building constructed on such plots is auspicious and beneficial to the owner and helps in successful and profitable business. Hotels and Restaurants are built for the Public as a business centre where people come and stay temporarily for sometime and after having rest, meals etc., proceed on for their destination. Thus the benefits of hotels and restaurants are of two folds - to the customer restaurants for good and delicious food and for decent comfortable stay as paying guest. The better this arrangement, the more is the popularity and fame of the hotel or restaurant in the country and outside. It is possible only when the construction of hotels and restaurants is done accordingly to the principles of Vaastu Shastra. Surely then there will be beneficial and profitable to the customers (Travelers) and the concerned people. The important facts to be kept in mind while establishing and running a hotel / restaurants business so as to make it progressive and profitable.